As a kid I can remember my mom going to "the city" which was Grand Island, Nebraska and once in a great while "splurging" on a piece of french silk pie and bringing it home. It was heaven, pure chocolate heaven. It was nothing like I had ever tasted and I couldn't WAIT until I was able to drive, I was going to go to Grand Island and get my own dang piece of pie one day! Great goals eh? Yea well.......come on I was a city kid at heart trapped in small town America and I was bustin' out baby! Well, when I asked my mom about a recipe for it years and years ago, she told me she didn't have one but thought it was really difficult to make so I never even looked any further. Well now that I am an advanced wannabe (in my mind anyway) I was ready to find this recipe, divide and conquer! That being said, I waited a long time to find a recipe with cooked eggs. Traditionally this pie has raw eggs in it. This is the only kind of pie I will eat. Last week, on that fateful day I was surfing You Tube as I normally do and there it was. There was the video I had been waiting for, showing how to make it. I thought there was no way it could be that easy. I mean yes, there are alot of steps and you will dirty alot of bowls and dishes, but who cares?!?!? This is...FRENCH. SILK. PIE. we are talking about! (was that really even a sentence? Nah, I didn't think so). This is the channel in which I found it. I emailed this user and never heard back but it wouldn't be right to not link you to his channel , croutonsandcrackerjacks. Let us delay no longer. Do you have any idea how hard it is to let this puppy sit at least 8 hours. Pfftt...I was like, you have GOT to be kidding me. But I did it! Here is what you need to get started! Ok here is where I change things a little. The order in which you prepare your steps. 1. Prepare pie crust and let it cool. 2. Melt chocolate, 30 seconds at a time in the microwave. Took me 3 times. Let cool. I didn't let me cool completely and it was still just fine. 3. Combine sugar and eggs in a saucepan. Whisk constantly and let come up to 160 degree's. It will cook the eggs to make them safe but not make scrambled eggs! 5. While it is cooling, whip 1 cup whipping cream just beyond soft peaks or to practically stiff peaks like I did. 7. When chocolate mixture is cooled, pour it into the butter and beat until smooth, then carefully fold it into the whipped cream and fold until totally combined! 8. Pour into prepared pie shell and refrigerate at least 8 hours, mine was overnight and then some. My GOD the perfection of it all. Before serving, cover in whipped cream, spread it, pipe it, or whatever method you want to use! You can also top that with shaved milk chocolate shavings! I hope you enjoy this as much as I did. 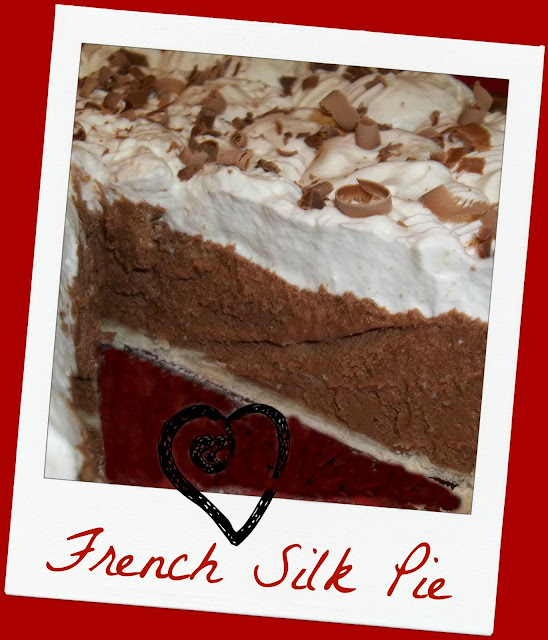 I had to wait to cut it to see if it really worked, it had to have the "French Silk Pie" texture, you know? It does and boy is it fantastic!! I had a fabulous recipe from a coworker years ago and lost it when I moved recently. I was so bummed. It was perfection!!! This one sounds VERY similar, I hope is! I have been overarching for awhile. (That one had a macadamia nut crust - which I think I will try with your Delicious looking recipe!) Either way, I'm sure this one is going to be just divine!